This is a kind of postscript to my blog entry from yesterday. After publishing yesterday, feeling pretty satisfied that I had used my time in Cleveland well, I continued on to Fort Myers. Then I got to wondering why Heather’s painting was not uploaded. Today, hooked back uo to the Internet, I discovered that the photo of her painting had never left my phone. Oh, boy! I had to learn a new thing–how to get photo from phone to WordPress with help from my computer. My iPad would have to rise to the occasion. Well, some hours later, I give up on amending original blog and settle for this special edition. Heather deserves a page of her own anyway, because she got me thinking in terms of long-pose painting in the first place, and because she and I have been progressing together, taking the same classes for several years now. 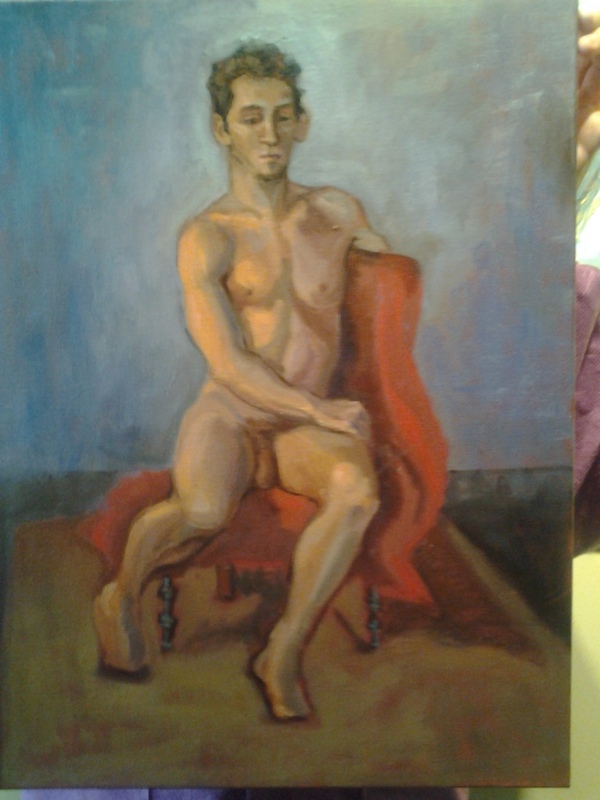 This entry was posted in art, art artist painter, artist, Nudes, oil painting, painter, Paintings, Portraits and tagged new hampshire, nudes, painters, paintings, portraits. Bookmark the permalink.